If you’re using Excel and you’ve already learned how to use INDEX MATCH, you’re well on your way to becoming proficient with Excel lookups. What INDEX MATCH MATCH offers you is a more powerful version of the formula. Instead of just a vertical lookup, INDEX MATCH MATCH allows you to perform a matrix lookup, which is also known as a two-way lookup. This combination formula may initially seem complex because of its three individual formulas, but after you understand each component and how they interact, using this tool will become second nature to you. INDEX MATCH MATCH is one of several lookup formulas, which include OFFSET MATCH MATCH, VLOOKUP HLOOKUP and VLOOKUP MATCH, that you should learn to become adept in database theory. A matrix lookup can only work if your data table has lookup values on both the top and left hand side. Basically, your data needs to be in a matrix format. People usually create matrixes, with lookup values both vertically and horizontally, to cross reference two different fields. 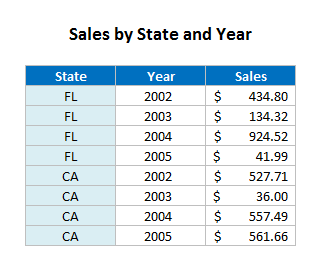 In the example below, we are cross referencing the field State with the field Year and showing the relevant data point for Sales. Before moving forward, ensure that you are using the proper formula for your data set. There are several other lookup options you can choose from if your data does not fit the requirements for INDEX MATCH MATCH. For example, if you only have lookup values on the top of your data set, you should consider using HLOOKUP. If you only have lookup values on the very left hand column of your data set, you should consider using VLOOKUP or INDEX MATCH. Below is the syntax for using this formula combination. Don’t worry if it doesn’t make sense now; the rest of this post will provide context for each component and we’ll review a more practical version of the syntax that’s easier to remember. Not surprisingly, INDEX MATCH MATCH is based on the INDEX and MATCH formulas, which we will now go through in detail. The INDEX formula asks you to specify a reference within a range and returns a value. In its simplest form, you just indicate either a row or column as your range, specify a reference point, and the value that matches that reference point is returned. 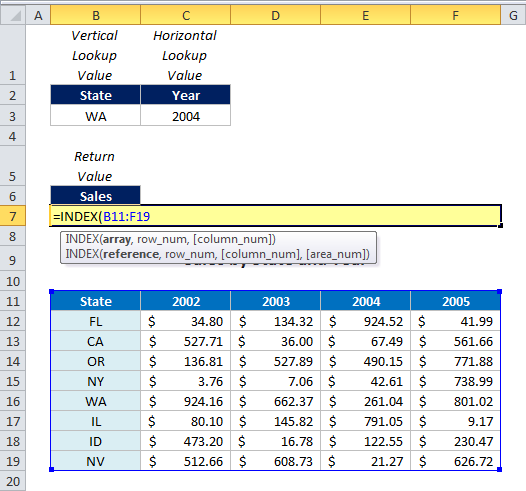 For example, if we were to select the left hand column of this table, and specify the reference “6”, the INDEX formula would return the value “WA”. For example, let’s say we selected the entire sales data table, and then specified “6” as the row number and “4” as the column number. The INDEX formula performs the intuitive action of going down 6 rows and over 4 columns with the range we selected to return the value of “$261.04”. The MATCH formula asks you to specify a value within a range and returns a reference. The MATCH formula is basically the reverse of the INDEX formula. The two formulas have the exact same components, but the inputs and outputs are rearranged. To give you an example of the MATCH formula, if we were to select the entire left hand column and then specify “WA” as our lookup value, the MATCH formula would return the number “6”. Please note that you have to put in a “0” as the last argument to ensure that the MATCH formula looks for an exact match. As mentioned before, when using the INDEX formula across a matrix it requires both a horizontal and vertical reference. The only additional complexity that INDEX MATCH MATCH adds is that the vertical and horizontal references are turned into MATCH formulas. Below is a simplified version of the syntax describing the inputs with the appropriate context for our goal. In case you get lost in the individual steps, you can always refer back to this notation. Excel must first calculate the result of the two MATCH formulas embedded within the INDEX formula. Since we know that “WA” is the sixth value down in the left hand column, and “2004” is the fourth value across in the top header row, those formulas become the values of 6 and 4 respectively. 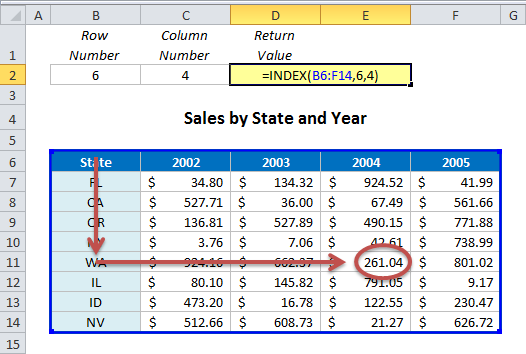 Once we’ve simplified those components, Excel essentially performs the exact same INDEX lookup that we demonstrated before; it goes down 6 rows and over 4 columns to pull the correct value of “$261.04”. INDEX MATCH MATCH probably won’t be a formula you use often. Most of the time when dealing with databases and data tables, you’ll be using vertical lookups to query results. However, in situations where you absolutely do need to perform a matrix lookup, INDEX MATCH MATCH is the best option you have. 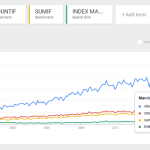 Thanks for sharing the “INDEX MATCH MATCH” formula. Even this formula has not been used more often because it is a bit complex and contain several syntax. Anyhow, this is very good tutorial that describe step by step clearly for following. It’s good job!. I do love it. Thanks for the great article! I have one important question though…. Can I create an Index Match Match where the values being looked up are in one Excel file and the returned values are being stored in a different Excel file? If so, how do I specify that? If I can’t use two different Excel files (workbooks), can I at least use two different worksheets in the same file and, if so, how do I specify that? Yes, you can write formulas across different workbooks, by literally just selecting the cells from those different workbooks. However, this is generally not recommended, because if anything changes with you store your files, the formula will be broken. Likewise, it’s definitely possible to write this formula within the same workbook across different worksheets. Simply click on the cells you want from the other worksheet, as you are writing the formula. I definitely recommend the latter approach if possible, as it is much more common and generally more stable. nice tutorial, thank you for this. It works for me properly only if I have data sorted in alphabetical order in the first column. What I am doing wrong? the lookup value and lookup column are backwards. Thanks for the catch. I must have flipped those when I was creating the example. The syntax has been updated. Does anyone know how to do this BACKWARDS??? As in, can I look up a value and it will tell me the corresponding row and column?? What you are trying to do would use the INDEX function. Here’s the way to to it in reverse : Be sure to Ctrl+Shift+Enter the forumulas below ! Feel free to replace =261.04 by =your referenfe cell. Hi Matthew, Thank you for the good explanation with the INDEX MATCH MATCH, however can it be also be done using two area? INDEX(MATCH,MATCH, area number)? thanks for the formulas. However I have been trying to use this formula but need do the match with two horizontal values but does not seem to work, do you have any idea? Can you have 3 different criteria? Ie – I want to match 1 vertical and 2 horizontal criteria, I tried using index match match match but that didn’t work as I got a reference error. I was also looking for how to do this backwards (same as Feedback, 20 Jan, 2014). So given 261.04, find the year and the state (in the example given). For example, can you find the biggest sales number (which is just MAX(C12:F19)), and then look up which state and year that was. Suppose you put that in C21 and drag it out to the right to F21. That row will have a bunch of FALSEs (meaning that the value doesn’t appear in the corresponding column), and the actual value you’re looking up (lookupvalue). This will give you the column that the value appears in (suppose this is in E3). This will give you the row that the value appears in. You can use this to get the state and year or whatever you want. Will this work if I have, for example, multiple rows with WA data? Matthew – I had an array that I have been wrestling with for 4 weeks – and not until I found your concise, easy to follow instructions was I able to complete my task. You are a life saver. THANKS! Can you show me how to retrieve match data using index match or if index match across different worksheets? i would like to be able to execute a lookup for a certain type of chair and as a result get the available colors. anybody that can help me out? I am trying to write a formula that will confirm cell C3 matches with somthing from Column R and if so return “Yes”, if not I want it to look in Column S and if it matches than return “second”, if not I want it to look in column T and if it matches than return “third”, otherwise return “not identtified”. Is anyone able to assist me? I know there has to be nested formulas in this combination but I am not sure which ones would work most efficiently. Dudz, I’m trying to use this formula to do almost something similar. Can you help me? 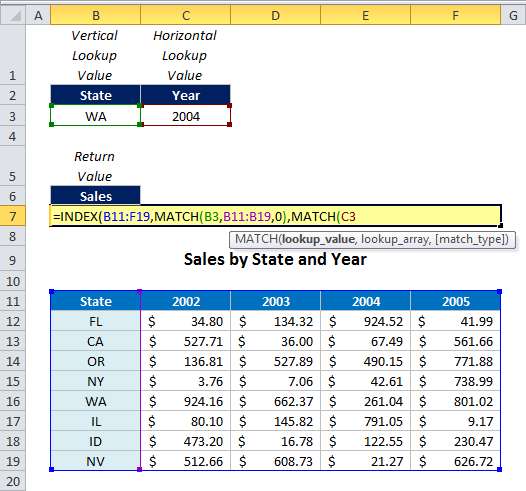 very useful approach – index Match Match and Matrix lookup, for us in developing world, it is very helpful. This is awesome. thanks. I have a task that is a little more complicated. Lets see if someonr knows how to solve this. I am matching two different sets of data that may have some common matching numbers. In the illustration above, we are applying the index match match to match two individual values to those in a matrix and get the desired result. I need to apply this to two different data sets and display the common values in a third data set. Am I clear ? should I rephrase? Lets hope you know how to do this. I am currently using the Index Match Match formula across several worksheets. However, the issue that I am having with my formula occurs when one of the worksheets that my Index Match Match formula uses to search through does not contain a match for the master sheet. When this occurs, I receive the #N/A. The formula works excellent if every worksheet has an entry that corresponds to the Master worksheet however not every worksheet will have a match to the master. Any suggestions? Is there any way to choose the 2nd or 3rd matching column value for the column reference? For example, if my column titles are Q1, Q2, Q3, Q4, Q1 is there any way to ensure that I pull the 2nd Q1 value? This is a very good article and thorough example! Thank you for posting! Just wondering, I have a data table with all the payroll information in columns and with account codes, however, some payroll categories are using the same account codes. and therefore I require a sum functionality. The added issue is that each person can be paid in different currencies and have different departments. I have to sum up all the cost centres and the currencies (which are in rows) and with the same account codes (In column) The way round it I have found is sumproduct where I can perform a multiple lookup for the columns and sum up all the tables with the given account codes. I want to know if there is another way to do this calculation as sumproduct takes a long time to calculate and I am investigating if Index and Match formulas can give me a faster calculation. Please help on the below. Thank for the tutorial. Much appreciated. However, I have a question following on from this. Is it possible to use the same formula to display an exact value using two vertical conditions at either ends of a matrix and the horizontal condition in the matrix ? 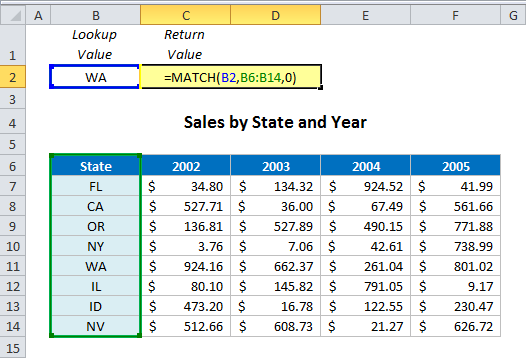 Using your matrix in this tutorial [assume column 5 was replaced by a name of county from that state]. 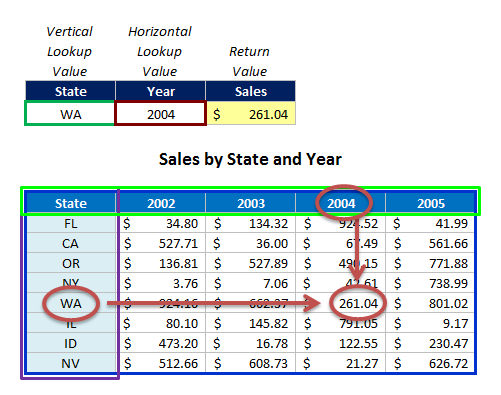 Is it possible to match a state (vertical column) to its corresponding county (Vertical column) before returning the exact value (the result) in a particular year (Horizontal column)? Thank you for writing this article – was exactly the solution I needed! 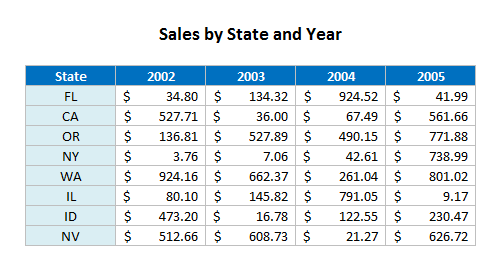 Return the sum sales for a specified state for years 2002-2003. I need the range of years to be dynamic and consecutive, meaning a user can fill in a start and end year (ie, ’02-’03, ’02-’05, etc.). Can you please assist? Much appreciated! Did you figure this one out? I have the same problem at the moment. In this case how do we pull the same information?? Don’t worry I have figured it out! I have been using Index match match in my deliverables workbook to consolidate data from my master file workbook. I have these in 2 different workbooks due to their massive size. My index match match on my deliverables file only returns data when the master data file is open otherwise I get a #VALUE! error. Is there a way to write the formula so I don’t have to have the master data file open in order to look at the delieverables file? I need help with INDEX MATCH. I undestand that index match will return a value higher than, lower than, or equal to your lookup value based upon entering a ‘1’, ‘-1’ or ‘0’ at the end of your formula. But I need it to return the value that is NEAREST to my lookup value. Hi, and what if I have to sum all of the results of the index/match, and not just return the first value matching? For complex models it turns very slow. The performance with INDEX MATCH MATH is awsome. This example was very helpful. My one question is if the matching criteria are not exact values how would the formula change? what if the criteria you are looking for is a range of numbers? how would this change the function? Index Match Match is really a powerful tool. 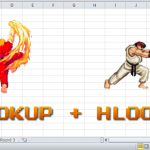 i believe in this simple tutorial a simple vlookup Match would do the trick, with less syntax. We can keep index match match for more complex workbook. Hi all, I need the opposite of that ..
I’ve a matrix , I want excel to lookup in this matrix for exact match to my lookup value then returns the left most column or the top most row ..
how to do that ?!! Hi, This was a great explanation and I got it to work well! I want to tweak my formula a bit more so that it will do the index/match lookup below (formula is working) but also use the information found on different worksheets within the same workbook — automatically changing the formula based on a column that contains the name of the workbook to use automatically… perhaps a INDIRECT command??? My main worksheet is called ‘JaxDentist’ There are various worksheets in the same workbook that are used to look up the information and return it to JaxDentist. Examples of the secondary worksheets being used to return data for the index match are called 315-09E, 310-13E, 155-16A, etc. On my worksheet Jax Dentist where data is being returned to, I have a column set up “X” that contains the name of the correct worksheet that excel should use to do the INDEX MATCH, but I can’t figure out the complete formula…. So here is my working formula for a cell to look up info on worksheet ‘315-09E’ for the data. How can I change these formulas so it will do continue to do the index match, but also variably also use the worksheet name that is contained in the column x of worksheet “JaxDentist” rather than me specifically naming the worksheet. I keep reading about INDIRECT command but can’t get it to integrate with the INDEX MATCH FORMULAs above. The data I am working with has thousands of lookups to do across 15-20 different worksheets in the same workbook. Is there any alternative to adding multiple Index Match functions together? For example, I have about 30 columns with numbers in them, and I am currently using Index Match when I have 3 or 4 dollar amounts to add together for the total. However, I now need to add all 30 columns together to find the total for operating profit (which is a row) for example. I can’t use a smiple Sum formula, because each month the number of columns may change. Love your post. Thanks for your help! I am using the following code in order to identify the Facility number associated with a facility. I have 2 issues; firstly there are multiple facilities with the same or similar name and the code search requires an exact name to use for the search. So if I have “Store ABC” and “QCI Store” the code will not pull up either if I just enter Store. How can I make the search more flexible to react on an incomplete name? I am adjusting the last 2 characters on eight extra lines to give me the 4 preceding and 4 post facilities based on the entered facility name however the requirement to enter the facility name exactly as it is in the database is very restrictive. Grateful for any help or advice. this is awesome! got my assignment done because of this! thanks!!!!!!!!!!! I have Three columns Col1- Rest Name, Col2-Locality col3-status. This is my Master Data. Now, In another sheet I have Rest Name and Locality. Now, if Rest name and locality is match then it should give status in the third column. Hello! I need to fit an item to a selection of crates. Is there a variation of this formula that will allow me to find all of the crates with dimensions greater than the item? is it possible to use this formula to match similar co-ordinate elements in an established data set with another data set containing similar values? then outputting the difference between the two data sets? for example, i have to complete grid set out works for piling job. each pile has a name and co-ordinate associated with it (e.g. Piles – 1A-2Y, 1A-2X, would have an associated co-ordinate value i.e. an Easting, Northing and Elevation). Lets say pile 1A-2Y has co-ords North 500, East 300 and Elv 100. i have to record the true value of these grid points in the field then i have to compare their value to the design value. Lets say i record North 499, East 301 and Elv 99 for the same pile (1A-2y) is this possible for excel to match the name of the pile in each data set then output the difference in the easting, northing and elevation ?? Is it possible to use the matching function to look at multiple variables? I am trying to build a quote spreadsheet that has to due with equipment and specs. My reference spreadsheet will have make, model, term, and price. So 3 variables have to match and then it will hopefully give me the price. 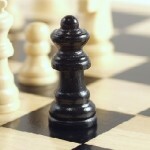 There may be 4 or 5 variables that have to match thus giving the customer the sales price. This is to avoid having someone go through a massive option sheet and I am using a drop box format that will prefill the price and is linked to a large option spreadsheet. Again, I want the price to fill automatically by the matching method. Suppose I want to do the exact opposite of what is done in the example. I want to search in a given column for an exact match and then return the value in the corresponding row. How do I do that? I would like to mention that I have several cells in the column that have exactly the same entry. I would like to seperate the search for each of these cells and return the corresponding values of the rows seperately. My Excel connects manners of transport to certain destinations. The manners of transport are seperated in different columns and the destinations in rows. The manners of transport can be connected to several destinations, so that’s why I have numerous cells that have the same entry. Matthew, thank you so much for this! This is absolutely genius!! Very informative and the explanation of the individual portions of the formula are very helpful in ensuring that I’m using it properly for my application. 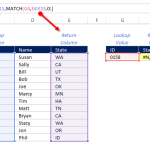 how you apply index match match function to attain the shipment values from the 5th row. as the quarter column contains same value throughout the column ? Hi, I am using an Index and Match function. The correct answer is provided in the formula bar however only N/A is shown in the cell. Why does it not show the correct answer? (such as in the formula bar). How can I get an index match formula to look up a group based on a hire date and return the correct bonus amount? When referencing the hire ranges, just make sure to use the lower bound when doing the lookups. In the example above that would be 1/1/2000, 1/1/2002, and 1/1/2006. This is all based off the assumption that there are no breaks in your hire date ranges. Could you help me with an issue? I wanted to use a formula that finds a value, “RA”, and returns the full name of the “RA” in column V when BuildingName and RoomName match. The table has the data in over 9,000 rows and column “U.” Only 210 rows have “RA” in column “Role” (O). I needed to assign the RA to each SubjectName (1 per row) based on the BuildingName and RoomName. There is only one “RA” that shares those two attributes with the multiple SubjectNames, 30-97. The RA’s names are also in the same columns as of the SubjectNames (first middle and last–3 columns). Can you help me understand which type of formula would be best for me? I want to use our data file to automatically update multiple products on a weekly basis. My weekly files are in the same format…I just want to search through the entire column with product #s in in to match to the weekly sheet, then place the correct week’s data in the corresponding cell. I was using vlookup but that doesn’t seem to work well for more than one specific week’s data. I need your help. I am looking for a formula that can search a value in a table or a list and give me the header of the value that i am looking for. Is there any possible formula for this? Thanks in advance for your help and advice. I have the same question as Mahmoud Ahmed. I have soccer data which contains Home Team, Away Team, Home Score, Away Score, with which I want to update a league table. So the formula needs to find the home team (In a row), the away team (in a column) and allocate the score to that cell. I’m thinking Index Match Match Match – is this possible? Matthew, thank you so much! No one has ever explained Index & Match fucntions better. 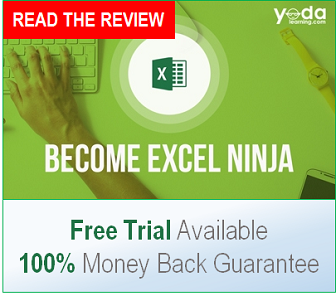 For that matter, your Excel tutorials are simply the best! I love this site and will share with my associates! Hi, this is a nice formula and very clearly explained. However, it does not help me as I need to cross reference 3 criteria in 3 columns and 2 criteria in 2 rows to return a number. My file has in column A cost centres, column B regions and column C type of expense. Across row 1 I have category like budget, actual, forecast and row two, qtr 1, qtr 2, etc. I am trying to summarise on the front sheet each cost centre per region per expense type but also if it is budget, actual or forecast and what quarter. As this tab is a new essbase retrieve I cannot add any extra rows or columns to it or the retrieve won’t work. This has been giving me headaches as I do not want to do this in numerous steps and open it to error. I tried, SUMPRODUCT, INDEX MATCH MATCH or simply SUMIFS but it is not working. I have a data file that consists of 2 columns (A=client ID # B = service dates). Each client has many service dates and I want to select the first service date that belongs to the client. ie: Client 1 has 4 rows with 4 service dates (Jan 2015, Feb 2015, Mar 2015 and Apr 2015). I am able to sort the data range so that the first service date is the top row for each client. I want some sort of formula that pulls Client 1 Jan 2015 and that I can run it for all the different clients. Any help would be much appreciated!! Thank you! This worked PERFECTLY for my situation — and greatly sped up my data-crunching. Appreciate it! Hello, could you tell me if it is possible to use this formula to search a cell from sheet 1 to find its match on Sheet 2, then compare against an additional cell to return a date in a separate column? Order number 123456 is on sheet one. I want to pull an invoice date over. On Sheet 2 a row contains the order #, warehouse # and the invoice date. The order # is listed on 2 separate rows though because it is broken down by warehouse 1 and then warehouse 2. I cannot use vlookup due to the duplicate order numbers on sheet2 but have not been able to find a formula that can accomplish this yet. I have tried to get this to work on a fairly simple data set, but cannot seen to do so. I want to lookup the day on which the maximum energy was generated from the following figures. The left hand column is the day. The maximum is 13.7 and should return 31. Instead, I get a N/A. It makes no difference if the cells are formatted as Numbers or General. Grateful for any suggestions where I am going wrong. Great explanation of Index Match Match. I refer people to this regularly. Hi, Great post. It works well for what I need. My question is when you set your range of the matrix can you use a table name instead of a range of cells so the index match match can be used to search the left most column and the header row of the specified table for the result also allowing for the matrix size to get bigger and not having to adjust the formula? Below is my database table. Below that is my horizontal and vertical references just above the outcome. I am trying to figure out how to incorporate a 2nd horizontal option. I need to be able to A. choose the builder B. choose the door and C. choose the wood then return the correct value. Any suggestions? I also copied my whole formula at the very bottom. Thanks in advance. I am using the formula to match dates from 2 sheets and give me a certain value. Is there a way to use this formula to look up values from more than one sheet? I am trying to retrieve information from hundreds of tabs in a closed workbook (Excel Formulas IIA.xlsx) and have them populate my recap workbook (Excel Formulas II.xlsx). I have used the INDIRECT formula (=INDIRECT(“‘[“&$A7&”.xlsx]”&$B7&”‘!”&C$4 where A7 is the file name Excel Formulas IIA; B7 is the tab name Sheet2; and C4 is the cell reference E4.). The full formula (no substitution) being =INDIRECT ([‘Excel Formulas IIA.xlsx]Sheet2’!C$4). This does not, however, allow me to update my recap workbook when the source workbook (Excel Formulas IIA) is closed. I have tried to use the INDEX MATCH formulas, but can only get them to work when the full source workbook, tab, and cell/cell range is entered-they do not work when using a substitution for the workbook, tab, and cell/cellrange. My original/test formula works and is =INDEX(‘[Excel Formulas IIA.xlsx]Sheet2′!$E:$E,MATCH(C1,'[Excel Formulas IIA.xlsx]Sheet2’!$C:$C,0)). When substituting formulas for the worksheet name and tab name, I get a formula of =INDEX(“‘[“&A8&”.xlsx]”&B8&”‘!$E:$E”,MATCH(C1,”‘[“&A8&”.xlsx]”&B8&”‘!$C:$C”,0)) where A8 is Excel Formulas IIA and B8 is Sheet2, the new formula is I receive the result of #VALUE. When stepping through the Evaluate Formula function within Excel, the MATCH section ends up failing. Is there a way to use an INDEX MATCH with substitutions/formulas for Workbook, Tab, and cells/cell ranges? Hello.. I now actually trying using Index match/IF function to try to index the value from “ColE” onto “ColB” , by matching “ColA” compare with “ColD”. result in “ColE” onto “ColA” with the same exact result number should appear in “ColB”??? And “colA” “Usw” data still match with “ColD” “Usw”even is not in the same row? something like new data replace with original data orderly, plus without deleting original data if the data don not appear in new data. What a great tool! Question Though- I used list boxes for my vertical and horizontal lookup. Some of the outputs are formatted in dollars and some general numbers or dates. How to I get the formatting to carry back to the output of the lookup? I am trying to create a formula using a number in cell B1 and the data in a range of cells in column B on one worksheet and finding the result in another worksheet. The problem is, I want excel to find the number shown in B1, which could be in any column on row one of another sheet and then finding the result for the next lookup criteria, which could be in one of two places….if found in the first group and result is blank, look in the next group to find the data. I tried to use Index match function but, it only gives result for first match. In such of some solutions I ran across mbaexcel.com and what an excellent virtual teacher. The content was really helpful. Using index-match-match and the earlier vlookup-hlookup combinations; simply well explained. Thank you for the good job. In search of some solutions I ran across mbaexcel.com and what an excellent virtual teacher. The content was really helpful. 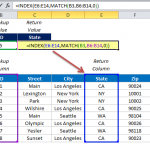 Using index-match-match and the earlier vlookup-hlookup combinations; simply well explained. Thank you for the good job. Thanks for the great knowledge sharing and tutorial! I’ve been using the INDEX MATCH MATCH formula for a while, but yesterday I tried to use it to implement an ASTM table. The formula returns the desired values from a certain rank. For example in column I have temperatures from 0 to 150 degrees and in lines I have density ranging from 0.690, 0.691, 0.692, …, 0.909.